In a medium bowl, whisk together the flour, lavender, and salt. In the bowl of a stand mixer fitted with the paddle attachment, cream the granulated sugar, butter, and vanilla on medium-low speed until slightly fluffy, about 2 minutes. Be careful not to overbeat. Scrape the side of the bowl with a rubber spatula. In a small bowl, whisk the milk and corn syrup to combine. Add the milk mixture to the butter-sugar mixture with the mixer on medium-low speed; beat until just combined. Scrape the sides of the bowl with the rubber spatula. Add the flour mixture all at once to the mixer bowl. With the mixer on low speed, beat until the dough just begins to pull away from the bottom of the bowl and forms a cohesive mass. Scrape the sides of the bowl to fully incorporate all the ingredients. Divide the dough in half and place each half on a sheet of plastic wrap. Loosely wrap the dough and form each half into a log about 2 in wide. Roll the logs along the counter, still wrapped in plastic wrap, in order to shape into perfect cylinders. Tighten the plastic wrap around the logs and freeze them for at least 2 hours, or overnight. If you have trouble forming the soft dough into logs, form the dough into a disk (or loose log shape), wrap it in plastic wrap, and place in the freezer for about 20 minutes, just until it is cold enough to shape into the necessary log, Line two baking sheets with parchment paper. Once frozen, unwrap one of the logs and use a sharp paring or chef’s knife to cut it into thin slices about 1/8 in thick; rotate the log as you slice, or the side sitting on the cutting surface will flatten. Arrange the slices about 1 in apart on one of the prepared baking sheets and place in the freezer for at least 10 minutes. Repeat with the second dough log and prepared baking sheet. If you need more room to fit all your dough slices, simply arrange them on additional sheets of parchment paper, layer the dough-covered papers one on top of the other on the second baking sheet in the freezer, and switch them out as you bake off each batch. (You can also wrap the baking sheets in plastic wrap and freeze the rounds for up to 1 week). Place one baking sheet of the frozen dough rounds in the oven and bake until they begin to brown just around the edges, 10 to 12 minutes, rotating the sheet halfway through the baking time. Using a stiff metal or plastic spatula, immediately press down lightly on each cookie to flatten it. Let the wafers cool on the baking sheet for 2 to 3 minutes, then transfer them to a wire rack to cool completely. The wafers should be very crispy when cooled. If they are not, place them back in the 350°F oven for 1 to 2 minutes more. Repeat to bake the additional sheets of frozen dough rounds. Store the wafers in an airtight container as soon as they have cooled. They will remain crispy at room temperature, tightly sealed, for about 24 hours. Freezing the baked wafers in a resealable plastic bag also works well, for up to 1 month. There is no need to defrost the wafers before assembling your cake. Refrigerate the bowl of a stand mixer and the whisk attachment (or a medium metal bowl and beaters from a hand mixer) until quite cold, about 15 minutes. Once chilled, remove the bowl and whisk from the refrigerator, add the cream, and whip it on medium speed until it is just thickened. Add the blueberry compote and confectioners’ sugar and, on medium-high speed, whip the cream until it holds stiff peaks that stand upright when the whisk is raised (the stiffer the cream, the more support it will provide the wafers in your cake). Use it immediately. In a small saucepan, combine 3 cups fresh blueberries, 1/3 cup (65 g) granulated sugar, 3 tbsp lemon juice, and 1/4 tsp salt over medium heat. Cook, uncovered and stirring frequently, until the mixture reduces to a generous 1 cup, 25 to 30 minutes. The mixture should be simmering but not vigorously boiling. Once reduced, the compote will be quite thick. Let cool to room temperature before using. The compote will keep tightly covered in the refrigerator for up to 1 week. Line the loaf pan with plastic wrap that hangs slightly over the pan sides. Using a small offset spatula or the back of a spoon, spread a generous layer of the whipped cream on the bottom of the lined pan. Cover as much of the whipped cream as possible with a layer of the wafers, filling any gaps with broken wafers. The pieces should touch. The goal is a solid layer of wafers. Continue layering whipped cream and wafers until you run out or reach the top of the pan, ending with whipped cream. Gently cover it with plastic wrap. Refrigerate for 24 hours. Peel the plastic wrap from the cake, place the serving platter over the cake, and invert the cake onto the platter. 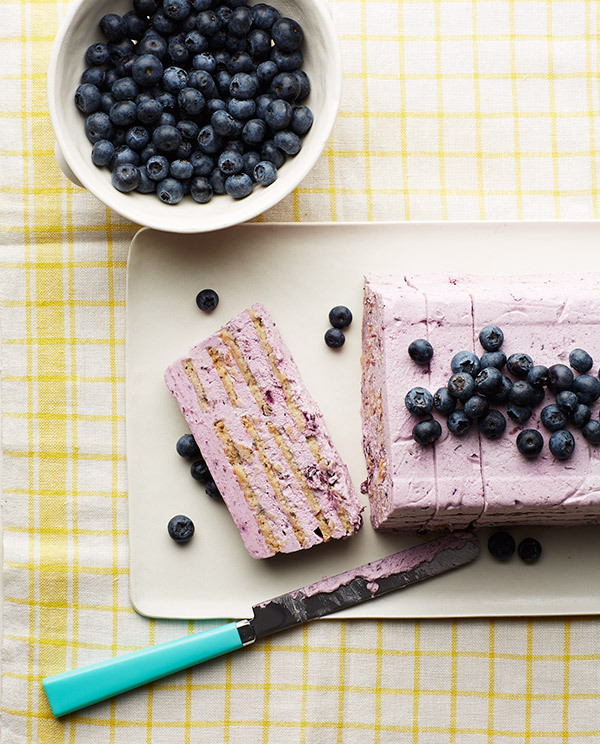 Carefully remove the pan and plastic-wrap lining and sprinkle fresh blueberries on top of the cake. Using a knife, cut it into slices and serve. Sagendorph, Jean and Jessie Sheehan. (2015). Icebox Cakes. San Francisco, CA: Chronicle Books.